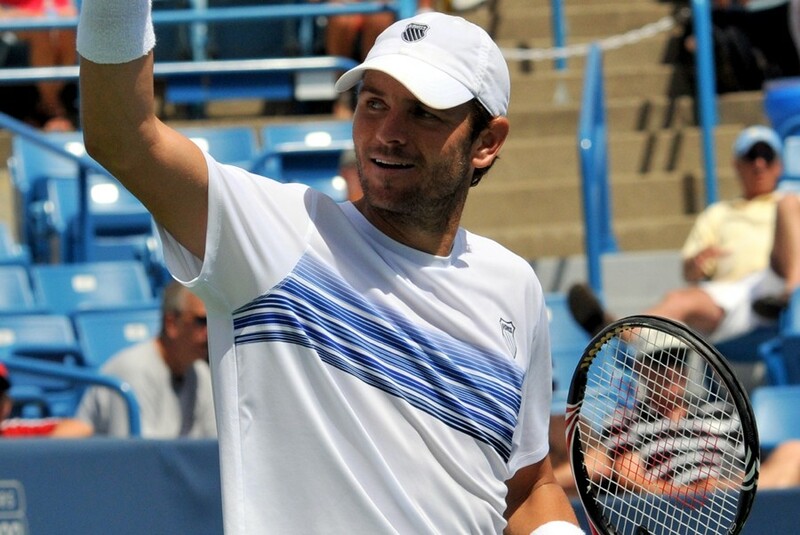 Mardy Fish, tied for third place in the Olympus US Open Series, cruised on Center Court today against Gilles Simon, 7-6(4), 7-5. Fish, who shed 30 pounds before the season, has been hot in 2010, winning back-to-back titles in Atlanta and Newport. He capped the victory by sending birthday wishes to his mother as he signed the on-court camera lens with a Sharpie. He meets No. 8 seed Fernando Verdasco in the second match on Grandstand on Tuesday. In the night cap, John Isner cruised in his first singles match in Cincinnati defeating Lukasz Kubot 6-2, 6-3. As usual, Isner dominated with his serve firing off 11 aces and winning 78% of points on his serves in a match that took a mere 58 minutes. Isner will meet David Nalbandian of Argentina who also won a quick match against Ivan Ljubicic. Nalbandian defeated Ljubicic 7-5, 6-0 in a little over an hour. In early second round action, world No. 7 Tomas Berdych defeated Paul-Henri Mathieu of France in straight sets 6-4, 6-4. Berdych was a 2010 Wimbledon finalist, where he beat Roger Federer before falling to eventual champion Rafael Nadal. Marcos Baghdatis of Cyprus needed three sets to dispatch Brazilian Thomaz Bellucci to join Berdych as the only two men to advance to the third round. The Cypriot took it in a third set tiebreak, 6-2, 4-6, 7-6(4). Baghdatis and Berdych will play each other Thursday in the Round of 16. For full results for Tuesday's action, click here.